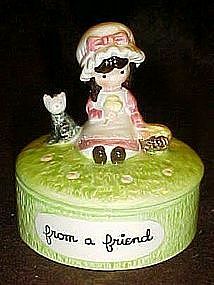 This is a trinket box with a girl sitting in the grass with a kitten. It is from Joan Walsh Anglund. It is dated 1974. It says from a friend on the front. It is in wonderful condition with no chips or cracks. It is 3" tall.